Well it’s been many a year since I made jam tarts, but I had a sudden urge to rediscover the joys of this classic little bake a couple of weeks ago. I had three jars of opened jam that I wanted to see the back of and a pot of clotted cream that I was finding hard to resist. Done deal. I bring you my easy jam tarts. There’s really nothing more simple to bake than jam tarts and these are my very first cooking memory. Standing on a stool in order to reach the table, I was proud and delighted to spoon the jam, perhaps not very deftly, into the pastry cases my mother had made. Waiting for them to come out of the oven was a trial and then waiting for them to cool enough to eat was even harder – hot jam can burn horribly. But what a treat. My mother used to make all sorts of jams and as I grew older I not only helped to pick the produce and stir the concoctions on the Aga, but ended up making many of the jams myself. I wasn’t very fond of blackcurrant, but gooseberry was one of my favourites. Some of the jams we made, way back when, are still on the pantry shelf. Recently my mother opened a pot of twenty plus year old strawberry jam to find it was still, not just OK, but really very good. Anyway, my three pots of jam consisted of: a strawberry and gooseberry, made at River Cottage last year; one of my two batches of apricot and vanilla made this year and a gooseberry gifted to me by a friend. I made my ab fab easy flaky pastry and away I went. As there was plenty of pastry left over, I made some treacle tarts too, but I’ll save those for another day. Crisp flakey pastry cases filled with fruity jam makes for a quick and simple bake - ideal for making with children and perfect with clotted cream. Cut butter into flour, salt and cinnamon and either rub between finger tips or pulse in a food processor until the mixture resembles coarse breadcrumbs. Cover and leave to rest in the fridge or a cool place for ½ hr. Roll out on a floured surface to about 3mm thick. Cut circles with a pastry cutter big enough to line a 12 hole tart tin - about 6 cm. Press the circles into the holes and place a heaped teaspoon of jam into each one. Bake at 200℃ for about 10 to 15 minutes or until the pastry is crisp and golden. 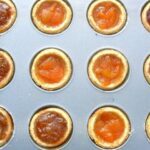 The pastry will make 36 jam tarts, but any not used can be kept in the fridge for a few days to be used for another purpose. I am sending these off to Pebble Soup and Coffee & Vanilla for Inheritance Recipes. Being my first ever bake, these easy jam tarts represent, childhood, a warm cosy kitchen and true comfort food. My tarts also goes to Veggie Desserts for the No Food Waste Challenge. Once opened, homemade jam generally doesn’t last that long, so being able to finish off three open jars meant I didn’t have to throw any of them away – hooray. Kate is hosting on behalf of Elizabeth’s Kitchen Diary. And as this recipe is a delicious but cheap bake and uses homemade jams, I am sending it off to Fab Food 4 All and Fuss Free Flavours for Credit Crunch Munch. Thanks for visiting Tin and Thyme. 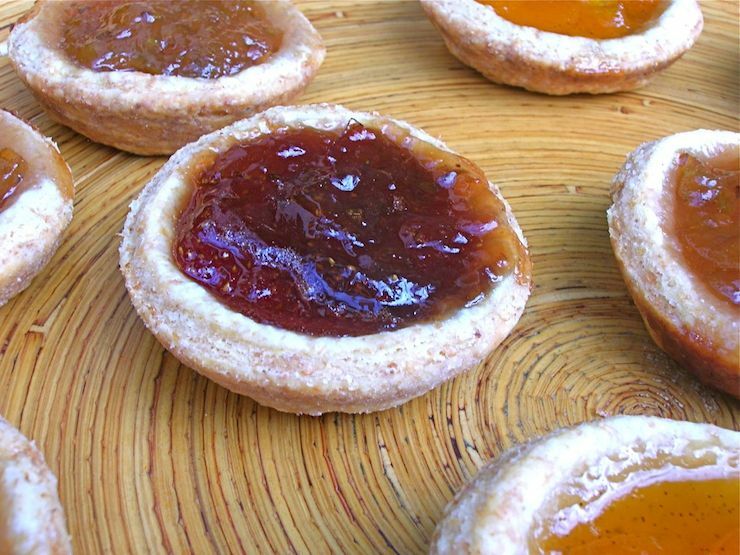 If you make these easy jam tarts, I’d love to hear about it in the comments below or via social media. Do share photos on social media too and use the hashtag #tinandthyme, so I can spot them. For more delicious and nutritious recipes, follow me on Twitter, Facebook, Instagram or Pinterest. Theres something very lovely I think about making Jam Tarts on a Sunday evening … ! Excellent Annabel, glad to have triggered your evening’s activity 🙂 I’m rather envious of your damson jam, which I haven’t had for many years but I remember as being most delicious. Oooh these are lovely and I loved reading about your childhood memories of making them and the jam itself. We have a lot of jam so I see tarts in my future! Thanks Kavey, it’s quite amazing how food can bring up flashes of really clear memories. I’ve got so many jars taking up space, that I think I need to make these more often. Delicious recipe and lovely memories! Thank you for sharing it with Inheritance Recipes. Thanks Margot, it’s quite amazing how food can trigger memory. They are so cute! !Thanks for sharin! Thanks Manu. It’s a real classic bake, but not one I make much any more. This pastry is the tastes, flakiest and easiest to handle pastry I’ve ever made. The magic must be in the yoghurt. Choclette, funny, I was just writing up a blog post this morning, for a couple weeks from now, about a biscuit/cookie and mentioned the similarity to jam tarts. I love jam tarts — eating them and making them — and yours look delightful! Thanks Jean. Your latest biscuit post reminded me of jam tarts too – only a little more sophisticated. It has been a really long time since I last had a jam tart. These look so adorable and tasty. Ahhhh, Jam Tarts. I don’t think I’ve had one in years! It used to be an ideal way to use up the cut off scraps from pastry. Definitely need to get back on the jam tart bandwagon! Yes, you’re right of course Craig. How could I have forgotten that crucial piece of history! What a lovely mix of jams you have. YOu really cannot go wrong with a jam tart, especially with a generous dollop of cream! Thanks Helen. I was tempted to open up a pot of blackcurrant and chilli jam, but decided that wouldn’t be in the spirit of using up my open jars. I haven’t had Jam tarts for years. Definitely an apricot or a raspberry kind of girl! Never had with clotted cream though before – naughty! I think I like most homemade jams Ceri, but I’m not actually very good at eating them. My jars tend to languish in the back of the cupboard unless I have folk around for tea. Clotted cream tempers the sweetness of jam – that’s my excuse and I’m sticking to it. I love jam tarts. Apparently at school, if I couldn’t remember what I’d done at the weekend I’d write I made jam tarts with my Nana in my news – helped by the fact that it was easy to spell! I’ll be making jam tarts with the Brownies on Pack holiday in a couple of weeks, so we’ll definitely have yours in mind. Jam tarts! Oh my days! I grew up eating packaged jam tarts (I’m not from a big baking family…ironic, since I’m mainly a baker! ), and they do truly represent childhood in a special way that not many things can. Thanks Camilla. I sort of thought you might have a few nifty recipes up your sleeve for using jam. I’m always after ideas. I keep coming across spelt and I must be brave enough to bake with it.Your tarts look gorgeous. Thanks Nayna. It’s certainly worth trying to see how you get on with it. Nice and simple recipe! It’s great that you can mix and match jams in the same badge to satisfy everyone on the table! These sound perfect for a afternoon tea stand – my mouth is watering just at the thought! Mmmmmm! I do love a good jam tart! Thank you Sammie. Your rhubarb and ginger jam sounds wonderful and would make a great filling for a jam tart. Not sure I can quite cope with mincemeat in October, but I shall be making some next month for sure. Of all the fancy bakes there are in the world, a part of my heart will always belong to simple bakes like these – you cannot beat a good jam tart; I love them! Ah lovely to hear you made them with your Granny Stuart. I never did any baking with mine, but she was a dab hand at pastry. Aren’t jam tarts great? Always a childhood favourite! Such a lovely way to use up jam! Thanks for sharing with the No Waste Food Challenge. I often make jam tarts with leftover pastry, but rarely set out to make them. However, I made some plum jam which is a bit of a runny set, so I might just make a batch of tarts and use some of it up! I always try really hard NOT to have leftover pastry, but now I’m not so sure that’s a good idea. Plum jam tarts sound so good.